Gordon Brown may have let it be known that he wants the Queen to be a “figurehead” during the economic crisis, but Her Majesty is quietly introducing new cost-cutting measures without any prompting from the Prime Minister. Mark Flanagan, the Queen’s head chef, discloses to Mandrake that Her Majesty has made it clear that she wants as much as possible of the food served in the Royal palaces to be produced on her estates. “We hope to make more use of HM’s dairy herd at Windsor in 2009,” Flanagan told me at a dinner in honour of Anton Mosimann, one of the Queen’s favourite chefs, at Mosimann’s private dining club in Belgravia. The decision to make greater use of the Windsor herd can also be seen as a reflection of the rising value of farm produce. The Queen used to have two herds of cattle at Windsor, but the pedigree Ayrshire herd was sold last year after a decision to turn the estate organic. “It was considered to be inefficient to have two small herds and so they kept the Jersey,” says the spokesman. The Duke of Edinburgh was so concerned about the welfare of the 186 cows and two bulls that he visited the farmer who bought them, Phillip Reed, in Wales earlier this year to check on their progress. Last week, it was disclosed that Brown was “increasingly looking to the head of state to lead the country through the bleak economic times”. The Queen’s diary of engagements has reportedly been discreetly tailored to ensure that she meets more people involved in the caring professions and those helping the victims of the downturn. The tactics of Scotland Yard investigating a series of leaks that had no bearing on national security and served only to embarrass Labour were compared to those used in Robert Mugabe’s Zimbabwe. MPs demanded protection from a ‘police state’ last night after the heavy-handed arrest of a Tory frontbencher shocked Westminster. 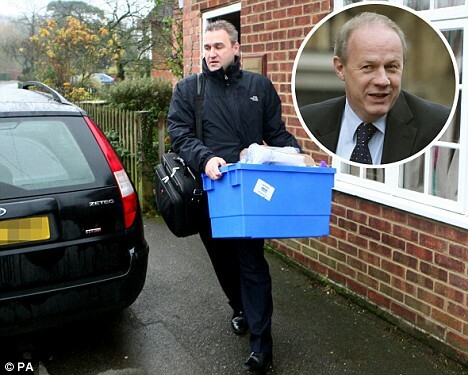 Extraordinary details of four simultaneous raids on immigration spokesman Damian Green’s homes and offices raised urgent questions about the independence of Parliament. The Oxford-educated father of two girls, who denies any wrongdoing, was fingerprinted and required to give a DNA sample before being released on bail after nine hours. Police seized his mobile phone, his Black-Berry, bank statements, computers containing confidential details of constituents, and were only prevented from carrying off legal documents by his wife, a barrister. Officers even leafed through the couple’s love letters. Last night the row between police and Parliament was turning into a political crisis for Gordon Brown, who faced accusations of standing by while the rights of MPs were being trampled. Ministers struggled to dispel suspicions that they knew in advance about the plan to arrest Mr Green, amid MPs’ fears that the case marked another step towards the politicisation of the police. The Tories issued a series of questions about the role of Home Secretary Jacqui Smith. Shadow Home Secretary Dominic Grieve said there were huge question marks over the claim that Mr Brown and Miss Smith had not been informed the arrest was about to take place. MPs also demanded assurances from Speaker Michael Martin that he would defend their interests after it emerged that he authorised an unprecedented police search of Mr Green’s office on Commons property. One called on Mr Martin to quit. Publicly the Prime Minister said only that his chief objective was to uphold the independence of the police. But his supporters accused the Tories of ‘playing politics’ with a routine police matter, and even suggested the Yard had undisclosed reasons to seize Mr Green. Thursday’s raids, involving some 20 officers, were carried out on Mr Green’s homes in west London and Kent, and his Commons and constituency offices. The MP was detained in Kent on suspicion of ‘conspiracy to commit misconduct in a public office’ and taken to London by Yard detectives ten days after a Home Office official was arrested on suspicion of leaking sensitive documents. Police are investigating Mr Green’s role in four leaks to the media over the past year – two of them to the Mail – that embarrassed the Home Office. The operation was authorised by Met Assistant Commissioner Bob Quick, Britain’s most senior counter-terrorism officer. The Crown Prosecution Service was also consulted. Sources said Mr Green is suspected of actively seeking leaked information, not just receiving it. Met Deputy Commissioner Sir Paul Stephenson, who has effectively being running the Met since Sir Ian Blair announced his resignation two months ago, was briefed by Mr Quick in advance. Sir Ian, who officially stepped down yesterday, was not aware of the operation. In the 30 minutes leading up to the raids, Sir Paul rang London Mayor Boris Johnson and Tory leader David Cameron. He also notified Sir David Normington, the Home Office permanent secretary, who claimed he deliberately did not tell Home Secretary Jacqui Smith until after the arrest. The news was relayed to Mr Brown about an hour later. By last night Mr Green’s ordeal had provoked outrage across the political spectrum, with all parties rallying to his defence. Tory MPs threatened to disrupt Wednesday’s Queen’s Speech debate. Veteran former Labour MP Tony Benn said the arrest of an MP amounted to a contempt of Parliament. ‘Once the police can interfere with Parliament, we are into the police state,’ he said. Tory MPs contrasted the case with that of leaks of sensitive information to BBC business editor Robert Peston. They raised suspicions that a ‘mole’ inside Downing Street or the Treasury had passed Mr Peston a string of market-moving banking ‘scoops’. Former Tory leader Michael Howard pointed to Mr Brown’s reputation for obtaining Government leaks when he was an Opposition MP. ‘If this approach had been in place when Gordon Brown was in opposition, he’d have spent half his time under arrest,’ he said. Miss Smith denied that ministers had been involved in any way in the arrest of Mr Green. Scandinavian nation reverses trend, mirrors results in Alaska, elsewhere. After years of decline, glaciers in Norway are again growing, reports the Norwegian Water Resources and Energy Directorate (NVE). The actual magnitude of the growth, which appears to have begun over the last two years, has not yet been quantified, says NVE Senior Engineer Hallgeir Elvehøy. 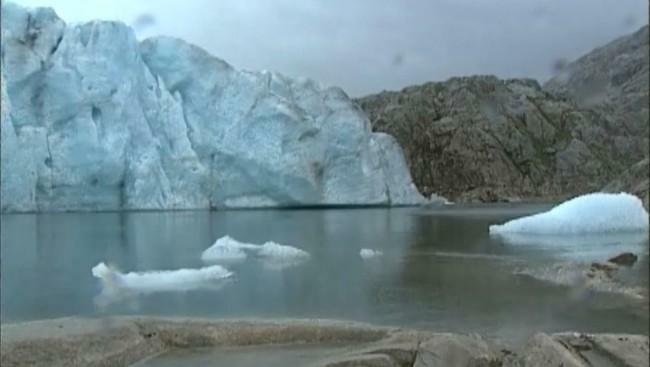 The flow rate of many glaciers has also declined. Glacier flow ultimately acts to reduce accumulation, as the ice moves to lower, warmer elevations. The original trend had been fairly rapid decline since the year 2000. The developments were originally reported by the Norwegian Broadcasting Corporation (NRK). DailyTech has previously reported on the growth in Alaskan glaciers, reversing a 250-year trend of loss. Some glaciers in Canada, California, and New Zealand are also growing, as the result of both colder temperatures and increased snowfall. Ed Josberger, a glaciologist with the U.S. Geological Survey, says the growth is “a bit of an anomaly”, but not to be unexpected. Despite the recent growth, most glaciers in the nation are still smaller than they were in 1982. However, Elvehøy says that the glaciers were even smaller during the ‘Medieval Warm Period’ of the Viking Era, prior to around the year 1350. Not all Norwegian glaciers appear to be affected, most notably those in the Jotenheimen region of Southern Norway. Two men appear to be meeting on a deserted street. Is a crime about to happen? CCTV cameras which can ‘predict’ if a crime is about to take place are being introduced on Britain’s streets. The cameras can alert operators to suspicious behaviour, such as loitering and unusually slow walking. Anyone spotted could then have to explain their behaviour to a police officer. The move has been compared to the Tom Cruise science-fiction film Minority Report, in which people are arrested before they commit planned offences. It will also fuel fears that Britain is becoming a surveillance society. There are already 4.2million cameras trained on the public. The technology could be used alongside many of these to allow evermore advanced scrutiny of our movements. The cameras, trained on public places, such as car parks, are being tested by Portsmouth City Council. Computers are programmed to analyse the movements of people or vehicles in the camera frame. 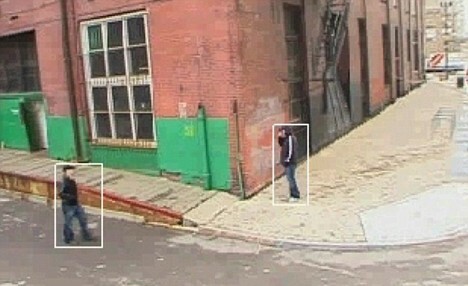 If someone is seen lurking in a particular area, the computer will send out an alarm to a CCTV operator. The operator will then check the image and – if concerned – ring the police. The aim is to stop crimes before they are committed. If a vehicle is moving too fast or slow – indicating joyriding or kerb-crawling, for example – a similar alert could be given. But the danger is that the innocent could be forced to account for their movements despite doing nothing wrong. Nick Hewitson, managing director of Smart CCTV, which has created the technology, denied it was a further infringement on privacy. He said the final decision on whether to send police to question a suspect would still rest with the CCTV operator. Mr Hewitson added: ‘Although we are a long way off Minority Report, it is a step closer. The system has been run successfully in several U.S. cities, including New York. Government departments here are said to be interested in putting it to wider use. At a time when Maoists are heading towards the road to one party dictatorship, GNP calls the Maoist not to resort to utopian dreams. In a press conference organized on 23 November, GNP said grabbing power with a call of ‘New Nepal,’ the Maoists are trying to take the country towards one party dictatorship. Trying to thrust a polity discarded by the world would be nothing but treason against the nation. This will only upset the political, economic, social foundations of the country. Nepal and her people will never accept it. The Maoists waged a decade-long violent struggle against the tiny poor country. This uncalled for war has not only demolished the valuable infrastructures donated by friendly countries but pushed the country back by a few decades. The policies and directives of the Maoist led government now are further vitiating the situation. The inherent motives of the Maoist to choose such a gigantic constituent assembly through proportional representation could be nothing but achieving their sinister objective by totally destroying the economic structure of the country and pushing it to total anarchy. In such a perilous situation, all the people forces of the country must come together to save her from impending disaster. It must be our one and only commitment. The people can no more take the Maoist familitism. Green Nepal Party, with very limited resources, has come out in the open to reeducate our people to save the people from disaster. At this terrible juncture, Green Nepal Party exhorts all forces to join hands with them to save the country from the impending doom. The GNP also humbly request Nepal’s donor, well wishers and friendly countries to come to Nepal’s rescue. Increasing corruption: Not one action has been taken against corrupt officials. Rather it is being institutionalized under patronage of political parties. Sister organization of bigger political parties resort to loot and corruption with impunity but the government shields them. The government under the Maoist leadership has added familism to existing Nepotism and favoritism. 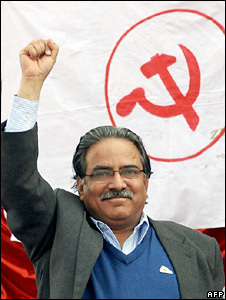 The Maoist must restore the looted property of the people immediately to their rightful owners. Compensating the victims from national exchequer is not only against the rule but anti national also. It is nothing but rewarding the criminals. The Maoist combatants cannot be integrated in the Nepali Army. They must be accommodated separately. The sky rocketing prices are killing the poor people and the scarcity and adulteration are aggravating their miseries. Government must control all these at once. A country rich in water resources suffers from acute shortage of potable drinking water. There is no irrigation. Paucity of power and load shedding, which are making the lives of the people miserable, are the glaring reflection of the inefficiency of the government. The armed groups in different districts are creating unrest that must be stopped. The unauthorized activities of sister organizations of the Maoist must be stopped without delay. Else, the country will be embroiled in a civil war. Mumbai – Pappu Mishra was tending to his customers at his glass-walled cafe at the gothic Victorian Chattrapati Shivaji Terminus railway station in Mumbai when he spotted two sprightly young men dressed in black. He remembers the two sauntering into the waiting hall, plonking their handbags on the floor, taking out a gun “which looked like an AK-47”, and walking toward the platforms where they gunned down late-evening commuters on the city’s busy suburban train network. “Their audaciousness was breath-taking,” he says. The men entered a platform and shot a man near an automated teller machine. Then they turned around and shot another commuter at the grubby, dark-tiled drinking water station around the corner. Then, the “foreign looking, fair skinned” men, as Mr Mishra remembers them, simply carried on killing. Outside the station, shipping firm executive Anil Kumar Goswami was sitting in a tea shop. He saw flashes of gunfire through the rusty ornamental iron and brass railings and wood carved windows. He walked towards one of the gates to find out what was happening. “As I entered the station, a shot rang out and I ducked. I lay on the floor and watched a horror film unfold,” he says. Back at the station cafe, Mr Mishra ordered all customers to lie down on the floor even as a crescendo of gunfire rattled the building. The shooters swung the gun around once. Bullets pierced the cafe’s glass walls, hitting one of his employees. He is now on a life support machine. In that short time, the two men turned one of India’s most historic railroad stations into a killing zone. “Bodies with gaping bullet wounds lay all over, and the waiting hall became a sea of blood,” says Mr Mishra. At least 10 people died at the station, also known as Victoria Terminus, on what newspapers described as Mumbai’s “darkest night”. Officials say that of the more than 100 people who died in Wednesday’s attacks by a group of unidentified gunmen, the majority of the dead were commuters waiting to get on to trains at the station. The police arrived half an hour after it was all over and the men had vanished into a balmy Mumbai evening. “The system is loose, the security is hollow. They killed as they wished, and there were no policemen around,” Mr Mishra says. A few minutes later, gunfire was heard from the hotel, and much later, Mr Amir heard that gunmen had taken guests hostage. Sixteen hours after the attacks, people are still waiting for their relatives to come out of the hotel. Vishram Tulsiram Nagde spent all of Thursday near the hotel trying to find out whether his brother and uncle, who worked in the hotel, were trapped inside. His brother works in the housekeeping department, and his uncle is a cook in the hotel. They did not return home after they finished work on Wednesday night. “I am very worried. We have no clue where they are. The police is not telling us anything. And we cannot get in touch with the hotel,” he says. All around, shops are shuttered and offices are closed. There is little traffic on the roads. Throngs of curious people move around talking about the attacks. VS Naipaul once famously said: “Mumbai is a crowd”. A day after the attacks, Mumbai was barely crawling. 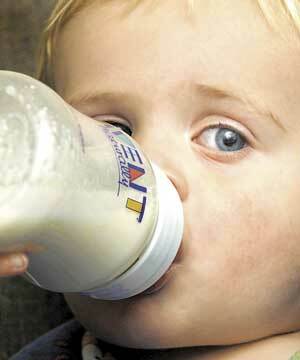 Worries over melamine in infant formula started in China and have spread to the United States. (CNN) — After first saying that they could not determine a threshold for the safe amount of certain toxic chemicals in infant formula, Food and Drug Administration officials said Friday that trace amounts are safe. “Amounts of the industrial chemical melamine or the melamine-like compound called cyanuric acid that are below 1.0 ppm [1,000 parts per billion] do not raise public health concerns,” said Stephen Sundlof, the FDA’s director of the Center for Food Safety and Applied Nutrition. When it became known in September that thousands of babies in China had been sickened by tainted infant formula, the FDA ordered the testing of U.S.-manufactured infant-formula products. Sundlof said Friday that results from 74 of 87 samples of infant formula and other products babies and young children had been completed. The results of the other 13 are pending. That total differed slightly from the one the FDA offered Thursday, when its acting commissioner of public affairs, Judy Leon, told CNN that 77 sample results had been completed and just 10 were outstanding. Among the 74 final test results discussed Friday, the FDA said, two samples of Nestle’s Good Start Supreme Infant Formula with Iron tested positive for melamine at levels of 137 and 140 parts per billion, well below the level of concern cited by Sundlof. In addition, three samples of Mead Johnson’s infant powder, Enfamil LIPIL with Iron, tested positive for cyanuric acid at an average of 247 parts per billion, also well below the FDA trace level. But the agency said then that it did not have enough data to determine a safe level of melamine and its analogues in infant formula. Sundlof said the trace levels of melamine or related compounds detected in the samples are 10,000-fold less than the amount associated with Chinese infant-formula contamination. According to the World Health Organization, contaminated infant formula in China has killed four babies and caused more than 47,000 infants and children to be hospitalized with possible kidney stones. Chinese-made infant formula is not available in the United States, because no Chinese manufacturer meets the requirements to sell infant formula in this country, according to the FDA. It was also the combination of melamine and cyanuric acid in pet food that caused thousands of dogs and cats to be sickened last year in the United States. The combination caused crystals to form in the animals’ kidneys. According to the FDA’s updated Interim Safety Assessment, infants are more vulnerable to the combination than are older children or adults because formula could be the infants’ sole source of nutrition. In addition, their kidneys may not have developed sufficiently to ward off the impact of the chemicals.